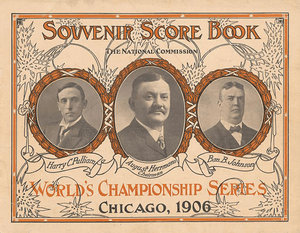 The 1906 World Series featured a crosstown matchup between the Chicago Cubs, who had posted the highest regular-season win total (116) and winning percentage (.763) in the major leagues since the advent of the 154-game season; and the Chicago White Sox. The White Sox, known as the “Hitless Wonders” after finishing with the worst team batting average (.230) in the American League, beat the Cubs in six games for one of the greatest upsets in Series history. The teams split the first four games; then the Hitless Wonders exploded for 26 hits in the last two games. True to their nickname, the White Sox hit only .198 as a team in winning the series but it bettered the .196 average produced by the Cubs.